The father's features are really taking shape now but still more refinement is needed, especially on his mouth, but I will again leave it overnight so I can have fresh eyes in the morning. The hair has been filled in and is very near completion and I have "aged" him more and added his smile lines. 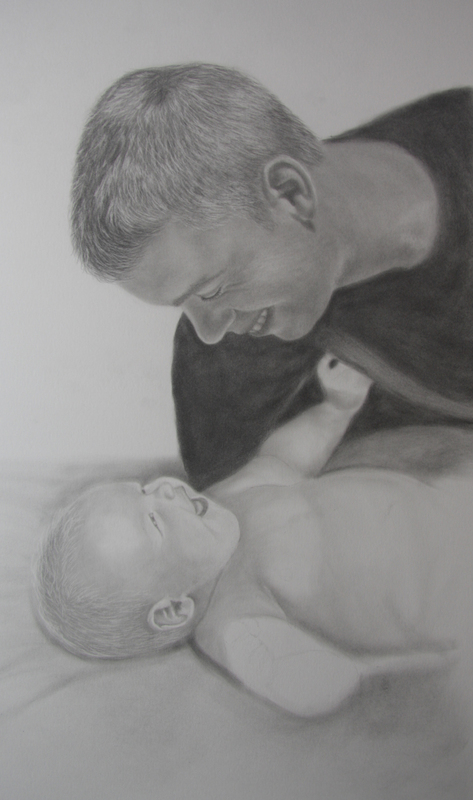 I will go back to work on the baby tomorrow as well and hopefully do the finishing touches on the baby's face and body. I check this site EVERY day to see yourprogress...I love that you do updates. My friend is actually viewing your site as well and considering getting a piece done also. Thanks Ashley I am so glad you are enjoying the progress :) I think the latest update is getting really close :) That is great about your friend, just let her know that if it is for xmas to decide sooner than later as I am booking up quite fast this year!